These drags are the secret weapon for professional groundskeepers across the country! Natural cocoa fibers float across the surface producing a beautiful finish with minimal movement and buildup of your infield mix. 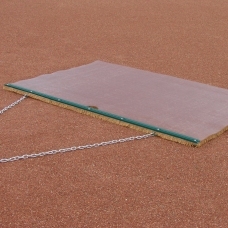 This Cocoa Drag Mat is the secret weapon for professional groundskeepers across the country! Natural cocoa fibers float across the surface producing a beautiful finish with minimal movement and buildup of your infield mix. Unlike steel drags, cocoa mats drastically reduce the accumulation of dirt when you’re finished. Flip the drag over and use the solid steel twin bladed cutting edge for shaving off high spots and filling in the low. Also great on turf to break up core aeration plugs and smooth in the top dressing material.